Open source and business, people said at the time, mixed as well as oil and water. Now, of course, things are different. Git is far and away the most popular version control system, clouds are mostly computers, and Microsoft is the most active organization on GitHub in the world. 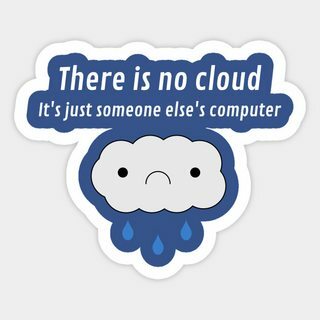 What did he mean by "clouds are mostly computers"? Clouds have always been computers. If he wrote this in that sentence, it must be telling something about business and open source, but what? This is actually simpler than it sounds. If we simplify a couple of statements found in this post to their core meanings (as relating to the term 'cloud') we see that the second paragraph states "When GitHub first launched … clouds were just things in the sky …", then the fourth paragraph compares that past to today with "Now … clouds are mostly computers …". Basically the first mention of clouds is referring to the fact that ten years ago, everyday conversations in which people used the term "cloud" were almost exclusively about the meteorological phenomenon in which condensed droplets or frozen crystals (usually of water) are suspended in the atmosphere. The second mention of clouds is a statement that in more recent times an everyday conversation including the term "cloud" is more likely to be about 'cloud computing', 'cloud storage', or another similarly computer oriented use of the word "cloud" than about the aforementioned meteorological phenomenon. Note: The term "cloud" being used in computing is in fact more than ten years old, however the computer related usage didn't really become house-hold vernacular until around 2009-2012*. Not the answer you're looking for? Browse other questions tagged github microsoft cloud or ask your own question. What do the labels JD, JL and ES mean? What must I consider when accepting outside contributions to an Open Source project that has a salaried core team?